I have been researching the best juicers on the market and I have decided that this is the one I recommend to my clients. 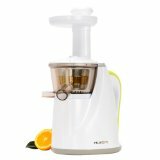 The Hurom Slow Juicer is a juice extractor that uses the patented Low Speed Technology System (LSTS) to extract juices. It is called a "Slow Juicer" because it operates at only 80 RPM and uses a mere 150 Watts of energy, instead of 1,000-24,000 RPM and up to 1,500 Watts of energy like a typical centrifugal "High Speed" juicer. But don't let the name fool you. The Slow Juicer actually juices faster than most typical juicers and expels significantly more juice from the same foods, with much drier pulp. The method of extraction is masticating and pressing, using the screw-like auger as a mortar and pestle. The action crushes and presses the food, releasing its deep-seated nutrients and enzymes. It also breaks up more of the phytonutrients, resulting in a richer colored juice that retains more vitamins and minerals. I recommend using a product called ION to kill any bacteria that might be on the fruit if it was imported from another country. I like to soak my produce in a bowl of water that has 20 drops of ION in the water. This will kill any bacteria that might be on the surface of the produce. Once I have made my juice I put 8 drops of ION per cup and 20 drops per gallon of juice. Stir it well and it will kill any bacteria in the fruit juice as well. It is non toxic and will oxygenate your body which boosts the immune system. ION is not only a water treatment but has been used medicinally as well. You can purchase ION from this website.